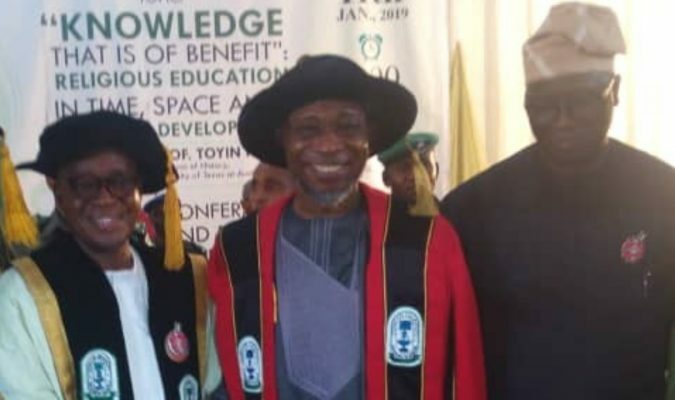 Fountain University, Osogbo, (FUO) on Monday conferred a Honorary Degree of Science on the immediate past Governor of Osun state, Rauf Aregbesola. Aregbesola was conferred with the honour during the 8th convocation of the university where 319 students graduated out of which 22 made First Class. The Vice Chancellor of the University, Professor Amidu Sanni, said the university would not relent in its mission to provide quality education and train the best for the nation’s human capital development. Receiving the award, Aregbesola lauded the prolific efforts of the management of the institution in its efforts in inculcating decency and good character through the combination of Islamic religion and academics to improve the lives of students of the institution. Aregbesola advocated good character and morality in all tertiary institutions in the country, adding that lack of good character, moral and self-discipline contributed to the economic hardship Nigeria is currently facing. “The constant increase in Poverty Index rate in Nigeria is caused by lack of self-discipline and good character. “Some people are there at the helms of affairs living in opulence, looting the money that is meant to be spent on improving infrastructures and improving the lives of the people in the society”, Aregbesola said. Osun State Governor, Alhaji Gboyega Oyetola charged the graduands to embrace entrepreneurship rather than seeking for white collar job. He added that only entrepreneurship will prevent them from falling victim of the high level of unemployment in the country. In his address, the institution’s Chairman Board of Trustees, Alhaji Abdulwaheed Adeola, appreciated the commitment of the members of Fountain University Governing Council led by Vice-Admiral Jubrilla Ayinla (rtd) GCON for their commitment in steering the affairs of the university in the right direction.